Follow us on Facebook, Twitter and Instagram. Click the links below! Click the envelope icon to email us with any questions. All kitten have been reserved! ​​We sell "pet" kittens only and do not sell breeding or show rights. ﻿All information about kittens isn't released until they're posted, after 7 weeks old or until we feel they are ready for adoption. ​​Kittens will be released to go home at 10-14 weeks of age or when we feel they are ready. The "go home" date will be indicated when they are posted on the "available" page for reserve. Rags2Love is a small TICA registered, in-home, Ragdoll cat and Ragdoll kitten breeder located in New York near Buffalo New York. 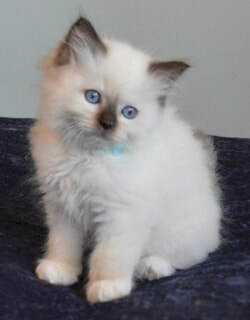 Our Ragdoll kittens are: ~ Registered with TICA ~ Lovingly raised in our home ~ Well socialized ~ Vetted ~ All of our Mom's and Dad's are tested HCM﻿ -/- either throu﻿gh testing by UC Davis or by parentage. Our cattery is FeLV / FIV free. We want to be sure all your questions are answered. Before contacting us, please visit our "Purchase Information" page where most questions are addressed. The link can be found on the top navigation bar under "more" or if you're on our mobile site, in the "touch" navigation bar in the upper left.